MCACS - THE IMPACT OF IN-HOSPITAL COMPLICATIONS ON THE LONG-TERM FUNCTIONAL OUTCOMES OF TRAUMA PATIENTS: A MULTICENTER STUDY. THE IMPACT OF IN-HOSPITAL COMPLICATIONS ON THE LONG-TERM FUNCTIONAL OUTCOMES OF TRAUMA PATIENTS: A MULTICENTER STUDY. Background: We sought to study the impact of complications on the long-term functional outcome of trauma patients. 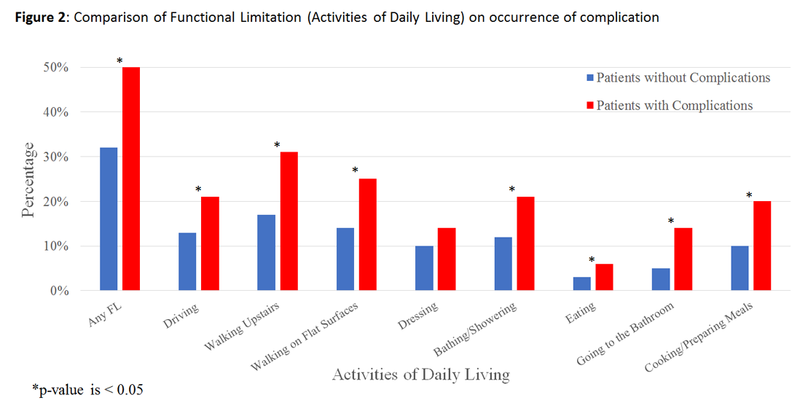 Methods: All patients with Injury Severity Score (ISS) ≥ 9 admitted to three Level I Trauma Centers between 2015 and 2017 were contacted by phone at 6-12 months post-injury and administered a validated Trauma Quality of Life survey assessing for functional limitation (FL). FL was defined as the inability to independently perform one or more activities of daily living (ADL; e.g. driving, walking on flat surfaces/upstairs, dressing, cooking/preparing meals). The impact of complications on FL was assessed using univariate then multivariate logistic regression models. Results: Out of 2511 patients, 1022 patients were included. The mean age was 58 years, 56% were male, 94% had blunt trauma, and the mean ISS was 15. A total of 168 patients (16.4%) had at least one in-hospital complication and reported significantly more FL in most ADLs at 6-12 months, compared to those without complications [Figure]. In multivariable analyses, adjusting for all other variables, the occurrence of an in-hospital complication was associated with a greater likelihood of FL at 6-12 months post-injury [OR = 1.82, 95% CI 1.22-2.69, P = 0.003]. Conclusion: Trauma patients with in-hospital complications have worse functional long-term outcome. In addition to primary complication prevention, more rehabilitation resources should be made available to the subgroup of trauma patients who survive complications.